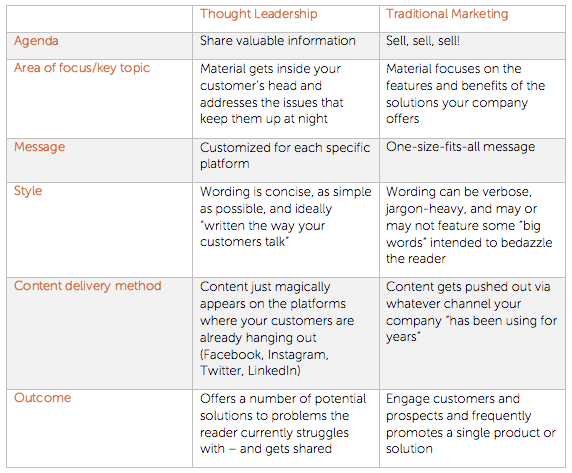 To help you produce high-quality thought leadership content, we’ve compiled some characteristics designed to make it easier to differentiate thought leadership from traditional marketing. Deliver the former, and you’ll likely grow your base of customers and prospects, who will follow you because they find you authentic, credible, and knowledgeable. (They like you, they really like you.) Produce the latter, however, and you become the content equivalent of those “Meet us for a free gourmet dinner, and oh, by the way, we have this great timeshare opportunity to tell you about” life experiences. Let’s start with the focal point. Imagine your company is selling a cloud storage solution to businesses that typically use on-premise servers. Traditional marketing might discuss the nuts and bolts of what goes into the solution (the features and benefits), why it’s better than the competitors’, etc. Thought leadership, on the other hand, is going to list the ways that cloud storage differs from on-site storage, describe the pros and cons of each, and might even feature the differing viewpoints of experts both internal and external to your organization. "Getting the message right means really knowing your audience. Getting the message right means really knowing your audience. If you have an informational article you’d like to share, the way in which you share it matters. Facebook users, for example, like to check into the social platform for a “creative break” from the work day, so why not give them something amusing while touching on the benefits of your product or service. Humor works on Facebook. If you were trying to build the business case for outsourcing transcription services, however, you might share the same information on LinkedIn, but possibly with a message that indicates the potential cost savings to a company’s bottom line, e.g., an infographic citing statistics that illustrate how many millions of dollars and lost staff productivity occur when companies transcribe their own interviews. Yes, figuring out how to reach your customers and prospects via the various social networks takes time, but the time you’ll spend customizing each message will likely pay dividends in how many people you reach and will maximize the impact of your carefully crafted thought leadership piece. Mom was right: How you say things really can be just as important as what you say. White papers and corporate marketing pieces often rely on industry jargon and, at least in the realm of B2B marketing, can get a little tedious. The best thought leadership pieces are carefully written in a concise, conversational style. Use the fewest number of words to get your point across, and skip the long, complicated word if a diminutive—sorry—a shorter, simpler one will do.These days, everyone suffers from too much to do and too little time to do it, so when you can say what you mean quickly and clearly, you increase the odds that readers will actually read what you’re producing. For years, some companies got great results from dropping newsletters in the mail to their customer base. But what works can shift quickly in this digital era. To make sure your content gets read, do some research to determine where your customers are and what they’re talking about. If 90 percent of your customers and prospects are on Instagram but your company doesn’t have an Instagram account, build the business case to change that—and start snapping (and editing and posting) attention-grabbing photos. Marketing engages followers and frequently promotes a product or solution. Thought leadership, however, starts conversations, solves problems, and establishes credibility for your brand. GE got it right when it created Txchnologist, a Tumblr-based microsite that pairs a video of a beating human heart with the article about an innovative way to deliver donated hearts for transplant. The microsite features stories that remind everyone that GE is in the business of innovation, and with the engaging content and compelling graphics, the content is ripe for sharing. As a result, GE indirectly promotes its brand while helping to maintain its credibility. In the end, thought leadership is essentially about sharing information and “giving back” to your audience. If traditional marketing is the sometimes-pushy relative who is convinced that their midlevel marketing product will change your life, thought leadership is your experienced friend who has tried the various products, knows you and how you like to operate, and can suggest something that will solve the problems that keep interrupting your daydreams.